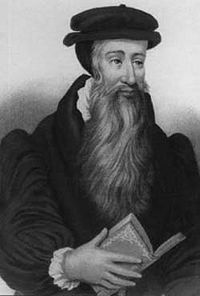 John Knox (1514?–1572) was a Scottish religious reformer who took the lead in reforming the Church in Scotland along Calvinist lines following his experience of working with John Calvin in Geneva. He is widely regarded as the father of the Protestant Reformation in Scotland and of the Church of Scotland. He was also a historian of the reformation. Opposed to women rulers, he had to deal with Mary I of Scotland who was a Roman Catholic, with whom he had several meetings during which he attempted to persuade her to abandon Catholicism. Perhaps his most enduring contribution was the impetus that he gave to education in Scotland due to his emphasis on people reading the Bible for themselves. Scotland developed an education system that placed the small nation ahead of many others. He championed compulsory education through to university level. The constitution that he wrote for the Scottish Church, which did not pass into law, advocated systematic aid for the poor. Even his critics praise his genuine concern for the common welfare  Andrew Lang describes him as a "truly Christian man" for "his regard for the poor" . Many of the details of Knox's early life are unclear. His place of birth is not known for certain, though Giffordgate, a suburb of the burgh of Haddington, East Lothian (16 miles/26 km east of Edinburgh), is the generally accepted location. He was born in 1515. His father, William Knox of Haddingtonshire, had fought at the Battle of Flodden. His mother's maiden name was Sinclair. The young Knox received his education via the Scottish Church, which was regarded as "liberal" compared with the pre-reformation Catholic standards of the day. The uncertainty about Knox's early life is such that it is not even known at which university he studied, since the dates and time he spent at college are uncertain. He certainly studied under the celebrated John Mair (or John Major), a native, like Knox, of East Lothian and one of the greatest scholars of his time. Mair was at the University of Glasgow in 1522 and at St. Andrews in 1531. 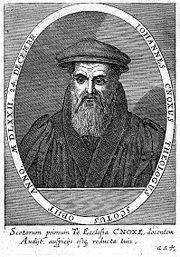 The name "John Knox" is listed amongst Glasgow's incorporati in 1522, though it is also claimed that Knox went to St. Andrews. He did not obtain an MA degree, possible because he refused to sign a repudiation of Lollardy, which was a requirement at the time, suggesting early reformist sympathies. Knox did not shine as an outstanding scholar when compared with contemporaries such as George Buchanan and Alesius. Indeed, there is no evidence that he even graduated. He did, however, know Latin well, and was familiar with the works of church Fathers such as Saint Augustine and Saint Jerome. From his writing it is clear that Knox learned the Greek and Hebrew languages after ending his formal studies. Knox is first mentioned as a priest in 1540, and in 1543 he was still an ordained Catholic clergyman. A notarial instrument dated 27 March 1543 and signed by him in his capacity as a priest is still in existence, and is kept in the charter-room at Tyninghame Castle. Up to this time, however, he seems to have employed himself in private tuition, rather than in parochial duties. At the moment when he last signed his name as a priest, he was probably already engaged in the office (which he held for several years) of tutor in the family of Hugh Douglas of Longniddry, in East Lothian. He was also responsible for the education of the son of a neighbor, John Cockburn of Ormiston. Both of these lairds, like Knox himself, had an interest in new religious ideas sweeping Europe at this time. Knox first publicly professed the Protestant faith about the end of 1545, though it is thought that his beliefs had been moving in that direction for some time. According to Calderwood, it was Thomas Guillaume, a fellow native of East Lothian, who was the first "to give Mr. Knox a taste of the truth." Guillaume was originally a member of the order of Blackfriars, and had been chaplain to James Hamilton, 2nd Earl of Arran, Regent of Scotland, for a short time in 1543. However, it is thought that the Knox's actual conversion was probably the result of his friendship with George Wishart. Wishart, who had returned to Scotland in 1544 after a period of banishment, had preached in favour of the reformation. Knox became one of Wishart's closest associates, and he followed him everywhere. He acted as Wishart's body-guard, bearing, it is said, a two-edged sword in order to defend Wishart against supporters of Cardinal David Beaton, leader of the anti-Protestant movement within the Scottish church. Nay, return to your bairns [children]. One is sufficient for a sacrifice. Wishart was subsequently tried for heresy and burnt at the stake in St Andrews in March 1546. Knox went on to become a Protestant minister in St Andrews, a place with which he had strong links throughout his life. It does not appear that he was ever officially ordained, though he was already a priest in the Roman Catholic Church. An account of the proceedings connected with his call to the ministry, together with a report of the first sermon he delivered in St. Andrews, is found in his book, History of the Reformation. After Beaton's death, the castle at St. Andrews became a place of refuge for many Scottish Protestants, and Knox resided there in relative peace along with his pupils, the sons of Longniddry and Ormiston, for several months. At the end of July 1547, however, the castle was attacked and captured by pro-Catholic French forces. Knox and some of the rest of the refugees were taken prisoner, and forced to row in the French galleys. How long I continued prisoner [and] what torments I sustained in the galleys, and what were the sobs of my heart, is now no time to recite. Yea, I know it well; for I see the steeple of that place where God first in public opened my mouth to glory; and I am fully persuaded, how weak soever I now appear, that I shall not depart this life, till that my tongue shall glorify his godly name in the same place. The French made attempts to have Knox renounce his Protestant beliefs and on one occasion asked him to kiss the feet of an image of the Virgin Mary. He threw it into the sea, saying "let our lady now save herself; for she is light enough; let her learn to swim." On his release early in 1549 through the apparent intervention of the English government, Knox found that he could be of little use in Scotland in its existing state. Like many of his countrymen in that troubled time, he therefore submitted to voluntary exile, continuing in his absence to devote himself to ministerial labours in connection with the Reformed Church, while for the first five years he worked as a minister of the English Church. During the reign of Edward VI, the Church of England was in a transitional state; some of its most marked peculiarities (to which Knox himself and others in Scotland and abroad afterwards objected) were then in abeyance, or at least not insisted upon. For example, the use of the prayer-book was not enforced, and neither was kneeling at the communion. Episcopal government was of course acknowledged; but Knox held his commission, as a reformed preacher, directly from the privy council, and was virtually independent of diocesan jurisdiction. He seems to have had no strong objection to episcopacy itself, although he disapproved of "your proud prelates' great dominions and charge, impossible by one man to be discharged"; on this and other grounds he declined the bishopric of Rochester in 1552. The offices he held in the Church of England are briefly indicated in the History, which says, "He was first appointed preacher to Berwick, then to Newcastle; and last he was called to London and to the southern parts of England, where he remained till the death of King Edward VI of England" (Works, i., 280). From other sources it appears that in 1551 he was appointed one of the six chaplains in ordinary to the king. In this capacity he joined the other chaplains in sanctioning, after revision, The Articles concerning an Uniformity in Religion of 1552, which became the basis of the Thirty-nine Articles of the Church of England. From England, after the death of Edward, Knox proceeded to the continent, travelling for a time from place to place in some uncertainty. 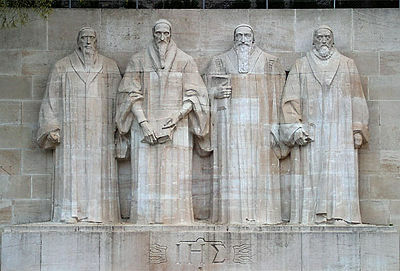 In September 1554, while living at Geneva, he accepted with Calvin's advice a call from the English Church at Frankfurt. Here controversies in connection with vestments, ceremonies, and the use of the English prayer-book awaited him and led in March 1555 to his resignation (cf. his treatise, A Brief Narrative of the Troubles which Arose at Frankfurt, reprinted in Laing's edition of his works). He returned to Geneva, where he was invited to become minister of the refugee English congregation. In August, however, he was induced to set out for Scotland, where he remained for nine months preaching evangelical doctrine in various parts of the country, persuading those who favored the Reformation to cease attending mass and join him in celebrating the Lord's Supper according to a reformed ritual. In May, he was cited to appear before the hierarchy in Edinburgh, and he boldly responded to the summons; but the bishops found it expedient not to proceed with the trial. In July an urgent call from his congregation at Geneva, probably combined with his desire to avoid persecution in Scotland, caused him to resume his Genevan ministry. His marriage to Marjorie Bowes, daughter of Richard Bowes, captain of Norham Castle, had meanwhile taken place, and his wife and mother-in-law joined him in Geneva. For who can denie but it is repugneth to nature, that the blind shall be appointed to leade and conduct such as do see? That the weake, the sicke and impotent persons shall norishe and kepe the hole and strong? And finallie, that the foolishe, madde and phrenetike shal governe the discrete and give counsel to such as be sober of mind. And such be al women, compared unto man in bearing of authoritie. For their sight in civile regiment is but blindness; their strength, weaknes; their counsel, foolishnes; and judgment, phrensie, if it be rightlie considered. With the exception of some months spent in Dieppe, France (1557-1558), when he was contemplating a return to Scotland, he continued to officiate in Geneva, while remaining deeply interested in his native land and in constant communication with the reform party there, till January 1559, when he finally left for home. He arrived in Edinburgh May 2, 1559. The time was a critical one. During his absence the reform party had become more numerous, more self-reliant and aggressive, and better consolidated. The queen dowager, Marie de Guise, acting as regent for her daughter, the young Mary I of Scotland, then in France, had become keener to crush the Protestants and determined to use force. Civil war was imminent, but each side shrank from the first step. Knox at once became the leader of the reformers. He preached against "idolatry" with the greatest boldness, with the result that what he called the "rascal multitude" began the "purging" of churches and the destruction of monasteries. Politics and religion were closely intertwined; the reformers were struggling to keep Scotland free from the yoke of France and did not hesitate to seek the help of England. Knox negotiated with the English government to secure its support, and he approved of the declaration by the lords of his party in October 1559 suspending their allegiance to the regent. The death of the latter in June 1560 opened the way to a cessation of hostilities and an agreement to leave the settlement of ecclesiastical questions to the Scottish estates. The doctrine, worship, and government of the Roman Church were overthrown by the parliament of 1560 and Protestantism established as the national religion. Knox, assisted by five other ministers, formulated the confession of faith adopted at this time and drew up the constitution of the new Church: the First Book of Discipline. The Church—or Kirk—was organised on something approaching Presbyterian lines. Priests were replaced by ministers (from the Latin for servants), with each parish governed by the Kirk Session of elders; but at this time the proposed replacement of bishops with "superintendents" was only partly implemented. John Knox admonishing Mary Queen of Scots. Stained glass window in Covenant Presbyterian Church, Long Beach, California, USA. Queen Mary returned to Scotland in August 1561 thoroughly predisposed against Knox, while he and the other reformers looked upon her with anxiety and suspicion. Fundamental differences of character and training made a keen encounter between the two inevitable. Five personal interviews between Knox and the queen are recorded, each at Mary's invitation. When Mary summoned Knox after he had preached against her proposed marriage to Don Carlos, son of Philip II of Spain, he reduced her to tears. She demanded, "What have ye to do with my marriage?" and when he proceeded to justify himself, she broke down and "howled." After she had dried her eyes, Knox told her that he had never much liked weeping and could hardly abide the tears of his own boys when he beat them. He explained to her that she had "no just occasion to be offended" because he was only speaking the truth (Guy 2004:176). In an earlier interview, Knox had told Mary that he was "as well content to live under your Grace as St Paul was to live under Nero." The reason women were not fit to rule, according to him, was that they were "idolatresses" who set reason aside and ruled by their emotions. This view of female psychology made Knox not only offensive to Mary but dangerous. It fed his political theory, set out in "The First Blast of the Trumpet Against the Monstrous Regiment of Women," that it was legitimate for the people to overthrow and even execute female rulers because of precedents in the Bible, for example the cases of Jezebel and Athalia, in which female rulers were overthrown to the obvious benefit of the state. Mary moved against Knox by having him arrested and put on trial after he summoned a "convocation of the brethren," in terms that could be interpreted as incitement to violence, to free two Calvinists who had threatened one of the royal priests. He was charged with conspiracy "to raise a tumult" against the queen, but he led his own defence and was acquitted. When the reformed religion was formally ratified by law in Scotland in 1560, Knox was appointed minister of the Church of St.Giles, then the great parish church of Edinburgh. He was at this time at the height of his powers, as is manifest in the style of his History of the Reformation—a work which he appears to have begun in about 1559 and completed over the next six or seven years. At the very beginning of his labours as minister of Edinburgh, he had the misfortune to lose his much-loved young wife. She left two sons, one of whom, Nathanael, died at Cambridge in 1580; the other, Eleazer, became vicar of Clacton Magna in the archdeaconry of Colchester and died in 1591. In 1564 Knox made a second marriage, which was greatly talked of at the time, not only because the bride was distantly related to the royal family but because she was seventeen and Knox three times older. The young lady was Margaret Stewart, daughter of Andrew, Lord Stewart of Ochiltree. She bore Knox three daughters, of whom the youngest, Elizabeth, became the wife of the famous John Welsh, minister of Ayr. At this time the reformer lived a very busy life. As well as being devoted to his work as a parish minister, he was much engrossed with the public affairs of the national Church and embroiled in continual controversies with the ecclesiastical and political factions of the day. He was, however, not without social and family enjoyments. A fair stipend of four hundred marks Scots, equal to about forty-four pounds of English money of that day, enabled him to afford hospitality and to advance money to a friend in need. Knox also received a stipend of an hundred pounds and a further hundred and sixty pounds scots directly from the queen's private rents in 1564 (NAS E30/11 f19r).He had a good house, which was provided and kept in repair by the municipality. During the greater part of his ministry in Edinburgh he lived in a house on a site now occupied by the City Council Chambers. Another house in Edinburgh, still preserved with little change and known since the eighteenth century at the latest as "John Knox's house," may have been occupied by him toward the close of his life  With all his severity, there must have been much sympathy in a man who was repeatedly invited to reconcile the sundered, husband with wife, friend with friend. He lived on good terms with his neighbors, many of whom became his intimate friends. His writings reveal, along with other aspects of his personality, a lively sense of humor. Mr. Knox would sometimes come in, and repose him in our college-yard, and call us scholars unto him, and bless us, and exhort us to know God and his work in our country, and stand by the good cause; to use our time well, and learn the good instructions, and follow the good example, of our masters… He was very weak. I saw him every day of his doctrine go hulie and fear [slowly and warily], with a furring of martriks about his neck, a staff in the one hand, and good godly Richard Ballantyne, his servant, holding up the other oxter [arm-pit], from the abbey to the parish church; and by the said Richard and another servant lifted up to the pulpit, where he behoved to lean at his first entry; but ere he had done with his sermon, he was so active and vigorous that he was like to ding that pulpit in blads and flee out of it. A Latin epistle sent by Sir Peter Young to Theodore Beza in 1579 contains another description of the reformer's personal appearance in his later years. His stature was "a little under middle height"; his "limbs were graceful"; his head "of moderate size"; his face "longish"; his nose "beyond the average length"; his forehead "rather narrow"; his brows "standing out like a ridge"; his cheeks "somewhat full" as well as "ruddy"; his mouth "large"; his "complexion darkish"; his eyes dark blue (or bluish grey) and his glance "keen"; his beard "black, with white hairs intermingled" and a "span and a half long." In his countenance, which was "grave and severe," "a certain graciousness was united with natural dignity and majesty.". Of this manner departit this man of God, the lycht of Scotland, the comfort of the Kirke within the same, the mirrour of Godliness, and patrone and example to all trew ministeris, in puritie of lyfe, soundness in doctrine, and in bauldness in reproving of wicketness, and one that caired not the favore of men (how great soever they were) to reprove thair abuses and synes. Here lyeth a man who in his life never feared the face of man, who hath been often threatened with dagge and dagger, but yet hath ended his dayes in peace and honour. John Knox's was buried in the graveyard at the Church of St Giles, Edinburgh . Andrew Lang, while commenting that Knox was admirable in his pastoral and private life, describes his "public and political life" as "much less admirable" .The Catholic Encyclopedia comments that "even in even in the rude and lawless age in which he lived, as surpassing almost everything recorded of his contemporaries, even those most closely in sympathy with his political and ecclesiastical views" . However, Knox was a man of conviction and did not hesitate to state his opinions, even before the Queen, even though he knew that they would be found objectionable. ↑ Commenting on Knox's own poverty, the Catholic Encyclopedia, in a mainly critical article, notes, "It is to his credit that he died, as he had lived, a poor man, and that he never enriched himself with the spoils of the Church which he had abandoned—a trait in which he contrasts singularly with the Protestant lords and lairds who were his friends and adherents." "John Knox," Catholic Encyclopedia John Knox retrieved 10-04-2007. The writer of this article placed Knox "outside the pale of Christianity altogether." ↑ A.T. Innes, "John Knox," Encyclopedia Brittannica, 11th ed., 882. Guy, John. My Heart is my Own. London, Fourth Estate, 2004. Mackenzie, The Reverend James. The History of Scotland. London: T. Nelson and Sons, 1888. Melville, James. Diary of James Melville. Edinburgh: The Bannatyne Club, 1829. Schaff, Philip, The New Schaff-Herzog Encyclopedia of Religious Knowledge, Vol. VI: Innocents - Liudger, Grand Rapids: Christian Classics Ethereal Library, 2000-01-27, v. 1. Ryrie, Alec. 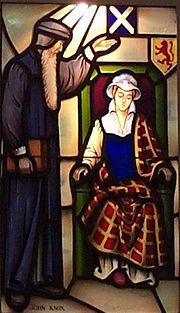 The Origins of the Scottish Reformation. Manchester: Manchester University Press, 2006. John Knox critical entry in the Catholic Encyclopedia. John Knox texts available at creeds.net. John Knox at Britannica online. This page was last modified on 18 May 2018, at 19:44.